To provide the highest quality of care to all our patients regardless of their background. To treat every patient holistically- this means looking at social, psychological and physical reasons when trying to deal with their problems. To continuously strive to improve the quality of care we provide as a team by being a “learning organisation”. This means learning from both good and bad aspects of our practice and to identify learning needs based upon this. To be involved in the teaching and training of other health professionals such as medical students, Doctors, Nurses, Counsellors and physios. 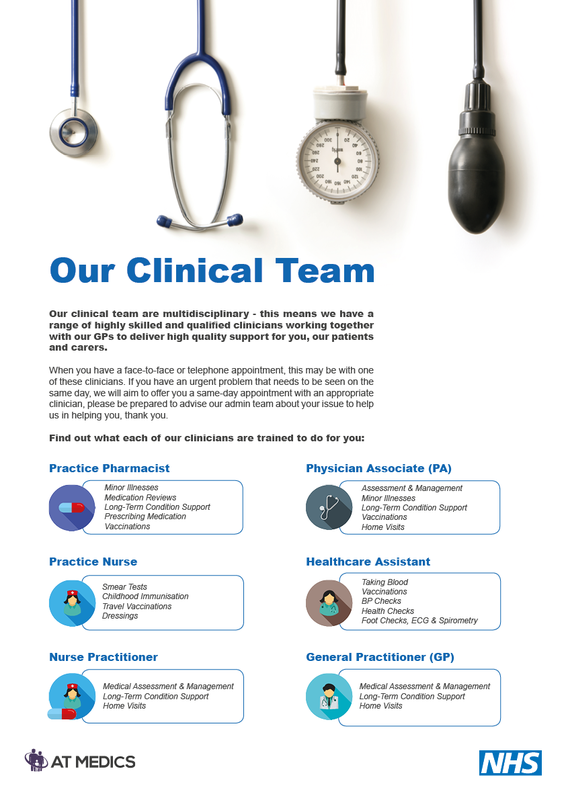 Our clinical team are multidisciplinary – this means we have a range of highly skilled and qualified clinicians working together with our GPs to deliver high quality support for you, our patients and carers. clinician, please be prepared to advise our admin team about your issue to help us in helping you, thank you. Please help us to help you and our other patients. Our doctors are able to see several patients in the surgery in the time it takes to do a single home visit. For this reason, we ask our patients to come to the surgery where required, and we also offer video and telephone consultations where appropriate. We want to see patients as quickly as possible, and the best way is often to encourage them to come to the surgery, because your GP will have access to all your medical records, including those held on computer. There are also better facilities for examining and treating patients at the surgery. Babies and small children should be brought to the surgery where we will do our best to see them promptly. If our reception staff are made aware that your child is particularly unwell, they will do everything they can to ensure that you are not kept waiting unnecessarily to see the GP. Transport/social problems –We cannot undertake home visits for reasons of convenience or lack of transport .We will be happy to provide you with details of local taxi firms. From experience we find that relatives, neighbours or friends are often willing to help out. Our responsibility to you is to resolve the medical problem you have; your responsibility is to take all the reasonable steps you are able to, to enable us to do that. Please request visits before 10am whenever possible as this allows the GP to plan their day accordingly. Late requests often lead to disruption of the appointment system and excessive waiting times for others. A doctor/nurse will call you back on most occasions to assess your problem. This is to enable the GP to prioritise visits. It may be that your problem can be dealt with by telephone advice, or that it would be more appropriate to send a nurse or indeed arrange a hospital attendance. It also prepares the GP to collect some information required as necessary for the visit. The GP may ask you to come to the surgery, where you will be seen as soon as possible. 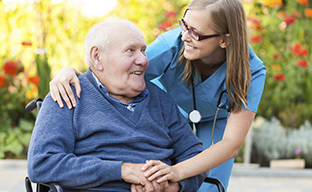 We would like to stress that no patient in serious and definite need of a home visit will be refused. In the past, GPs were able to routinely follow up home visits. Sadly, pressures of time and more patients needing attention means this is usually no longer possible. Some problems such as severe chest pains or shortness of breath are medical emergencies and you will be advised to dial 999. If you wish to reconsider or do not consider that you have opted in or out, you may contact our practice reception to discuss further and appropriate action will be taken. Find out more about Your Information and Data Processing. Extract from our Care Quality Commission statement of purpose, outlining Our service aims and objectives. We are passionate about inspiring managers and leaders who offer consistent approach, motivation and satisfaction to staff. Our Investors in People accreditation demonstrates our commitment to improvement in service delivery through development of all employees within our organisation. Investors in People is a management framework for high performance through people, and is recognised across the world as a mark of excellence. Care Quality Commission (CQC) is the independent regulator of health and social care in England. They make sure health and social care services provide people with safe, effective, compassionate, high-quality care and we encourage care services to improve. CQC monitors, inspects and regulates services to make sure they meet fundamental standards of quality and safety and publish what they find to help people choose care. The Loxford Practice was rated ‘Requires Improvement’ by CQC on 25 August 2017 – find out more about the award. Please ask for advice from reception if you have a form that you think the doctor needs to fill in. You may be asked to leave it at reception and collect it at a later date. A charge will be made for forms that are not covered by the NHS (view our fees). Please do not ask a doctor to fill in a form or write a letter during surgery as this causes delays for other patients. Letters regarding housing will not be written except at the formal request of the housing department or housing association. The doctors DO NOT sign passport forms or driving licence applications. IMPORTANT: read our guidance on Letters and Reports before you book an appointment. All of our practice staff are aware of the importance of confidentiality. We train staff on all aspects of confidentiality with respect to both manual and electronic health records. We keep all your health information confidential and secure in accordance with the Data Protection Act 1998, and have a legal responsibility to keep confidential all of the information held about you. We respect your right to privacy. You have a right to access your medical records in accordance with the Access to Records Act 1990. Any request for a report or copies of notes requires a signed patient consent form and will incur a charge. Further information is available from reception. We respect the public’s right to know how public services are organised and run. You can find our Publication Scheme on the Freedom of Information website. If you would like a chaperone when you see the doctor or nurse, please feel free to bring someone with you, or ask at reception when making your appointment. If you attend an urgent appointment you will be asked to see whichever doctor is available. If you require an interpreter either call or come into the surgery and we will be happy to arrange the service. The service covers a large range of languages, but you must inform us at least three days before your appointment. For free confidential advice or information on health services in Redbridge, call Barking, Havering, Redbridge University Hospitals NHS Trust on 01708 435454. Let us know early if you need to cancel your appointment so we can offer the appointment to someone else. This practice is commissioned by NHS Redbridge CCG. Clinics for Asthma, Diabetes, Hypertension, Cervical Screening, Childhood Immunizations, Maternity Services (Antenatal Care, Post Natal Care, Baby Checks, etc), Family Planning Services, Travel Advice and Immunizations, Adult immunizations, Stopping Smoking Clinic. What is a ‘Named Accountable GPs’ role? A named accountable GP takes responsibility for the coordination and delivery of all appropriate patient services required (based on the clinical judgement of the named accountable GP). Additionally, if a third party requests your GPs information, this is the GP name that you would give. Does the requirement mean 24 hour responsibility for patients? Be indirectly responsibility for the work of other doctors or health professionals. Have 24 hour responsibility for the patient or have to change their working hours. The requirement does not imply personal availability for GPs throughout the working week. No. Patients can and should feel free to choose to see any GP or nurse in the practice in line with current arrangements. However, some patients may prefer to see their named GP for continuity of care. What does this mean for patients with complex healthcare needs? If you require a care plan, your named GP would be responsible for ensuring this is created with you and reviewed appropriately. Can patients continue to see their preferred GP if different to their named GP? Yes, this does not have to change. Please continue to make appointments with your preferred GP. Can patients change their named GP? Having a named GP different to your preferred GP will not restrict your care in any way. However, if you would like to request that your named GP be changed please put this in writing addressed to the Practice Manager. Please speak to a member of our staff if you require further information. From April 2015, all GP practices are required to declare the mean earnings (i.e. average pay) for GPs working to deliver NHS services to patients at the practice for over six months. Alongside the mean figure, practices are required to publish the number of Full-time, Part-time and regular Locum GPs at the practice. Please note that AT Medics began its management of The Loxford Practice in August 2016. The average pay for GPs working in The Loxford Practice in the last financial year was £55,254 before tax and National Insurance. This is for 2 part time GPs and 2 Locum GPs who worked in the practice for more than six months.